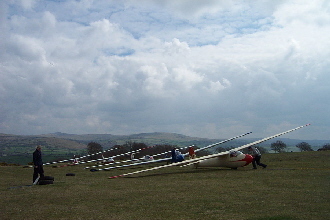 The club operates on Saturdays, Sundays, Wednesdays and most Bank Holidays Weather permitting. We do not fly when it's raining or in very windy conditions. Typically members arrive at the airfield between 08:30a.m. - 09:00a.m. 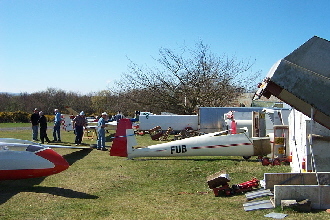 to prepare the equipment, get the club gliders out of the hanger and to assemble ( rig ) the private gliders. Flying commences at around 10:00a.m. The club operates on a first come, first served basis. The earlier you arrive the sooner you get to fly.